When Kim Kardashian took the Ice Bucket Challenge last week on Ellen, I figured it was safe to assume that the campaign had “jumped the shark.” But it’s sure been a good run. In fact, as of September 15, 2014, the campaign has raised a whopping $100 million dollars for ALS research. Not a bad haul considering that last year ALS took in $1.3 million during the same time span. And apparently Facebook was able to rake some serious cash from the challenge as well. A recent Forbes article by Jeff Bercovic reports that “Ice Bucket Challenge videos were viewed more than 10 billion times and reached more than 440 million people.” And the more views Facebook receives, the more money they make in ad sales. This got me thinking…How can ALS raise even more scratch in 2015 and take the Ice Bucket Challenge to the next level? Here are nine ideas that could help the program grow and prosper. Create a Brand Identity: The Ice Bucket challenge is in serious need of a brand identity. A well-designed logo would become an iconic symbol that would visually represent the program and distinguish it in the minds of donors. The identity should be distinct yet connected to the ALS brand. 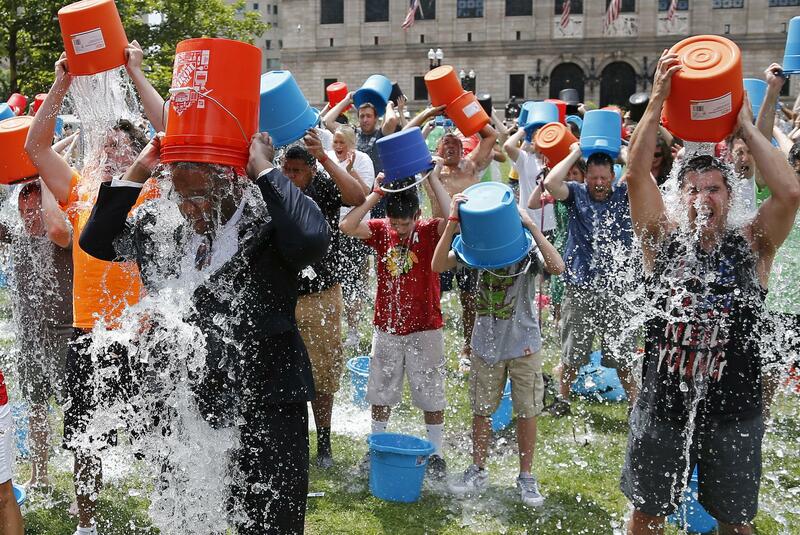 Build a Microsite: ALS should consider creating a microsite for the Ice Bucket Challenge. Wikipedia defines a microsite as “an individual web page or a small cluster of pages which are meant to function as a discrete entity within an existing website or to complement an offline activity”. The microsite’s main landing page could have its own domain name or subdomain. Microsites are easy maintain to and are a perfect solution for a campaign with a limited life cycle such as the Ice Bucket Challenge. Feature Bloopers: My guess is that a few ice bucket challenges have gone seriously wrong, and there is some funny footage floating around out there. Why not create a series of blooper videos? People love watching outtakes of movies and TV shows. In fact, they’re often the best part of the movie. Get Cities and Towns Involved: ALS could launch a contest where cities and towns could compete to see who can raise the most dough and activate the largest number of participants. ALS could come up with some incentive/prize for the city or town that brings in the most cash. Winners could based on population size. Mayors could challenge rival towns to go head-to-head to see who can raise the most cash. The press love municipal rivalries so you know it would generate a ton of publicity for the participating towns as well as the challenge. Display Window Clings on Freezer Doors: Every supermarket from the Piggly Wiggly to Wegmans sells ice. And my guess is that every supermarket chain would be happy to place a window cling on the ice stall freezer door to promote ice sales and support a good cause. Partner with a Home Improvement Chain: Home Depot and Lowes sell buckets of all shapes and sizes. ALS should forge a partnership with one of the home improvement chains so a portion of every bucket sale goes directly to support ALS. Create a Facebook Contest: This program is clearly a big win for Facebook. ALS should partner with Facebook to offer a prize to the Ice Bucket Challenge video that receives the most views. Design a T-Shirt: T-shirts are walking billboards. Offer T-shirts as an incentive to donors who reach specific fundraising goals. Donors will wear the t-shirt as a badge of honor. The T-shirt would also provide great brand visibility for the corporate sponsor. So what say you? Any ideas on how the Ice Bucket Challenge can come back bigger and better in 2015? I would love to hear your thoughts and ideas. self? Either way stay up the excellent quality writing, it is rare to see a great blog like this one today..